Think you cannot hit a lower bottom? Trust me, you can. I can . In fact, I did it several times. I lost over 120 pounds and thought I could never gain all that weight back. Then my world fell apart and I used that as an excuse to eat. I gained not only the 120 pounds but an additional 65 pounds. I lost almost 50 pounds and saw the pounds start to creep back on again. Same at 150 pounds. There were lots of lower bottoms. If I thought at all, it was always "I just need to eat to get through this . . . " It was the name of the food game I played. I always lost. As long as I live, I can never think I have reached the lowest possible bottom. I hope to never experience one, but a lower bottom is always possible. If it were impossible, we would not have 1,253 diet books, one hundred seventeen different versions of gastric-bypass operations, and clothing with elastic waistbands. Not today. Today I am reminded that it does not matter what happens in life, I cannot eat over it. If I choose food over dealing with the emotions, the actions, the pain . . . . 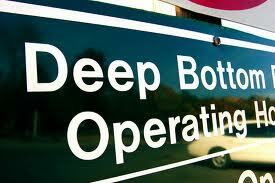 I choose to seek a lower bottom. I use to say that the true test of whether or not I can live through misery without bringing food into the mix would be when I faced tragedy and loss. Well, these past two months I have felt like I was facing hell without my watering can. I had some financial setbacks, some health issues, and lost my Mother and my cousin all within an agonizingly short amount of time. I didn't use food to get through it. I didn't use food to numb myself from feelings, or distance myself from people. I kept remembering what I once heard said to alcoholic who was dealing with a horrible tragedy. "I know what you are thinking and no one would blame you if you did, but I hope you won't. Either I have enough financial resources to meet my needs or I don't. Either I have perfect health, or I don't. I just don't eat over it. Today that has to be the most important thing. When it is not the most important thing, it becomes the only thing - an insidious thing. Oh, there will be a veil of suffering over a loss of a job, a limb or a loved one, but once the addict uses food as a drug, it becomes all about the food. I am not being dramatic. This is the reality of a food addict. Losing my mother was earth-shattering in my life. If I had picked up the food I would still be numbed to the worse of the feelings. They never heal when we are using. The just fester until we stop. leaving wounds open for the day we put the food down. Not using food, I am experiencing the loss in real time, without damaging my body and soul. In return, I am finding amazing strength in healing without food. I have newborn respect and love for my siblings that was not always appreciated in the past. It would not be so if I was face down in a pizza. When I pick up food, is cronies come too: resentment, anger, selfishness, entitlement, loathing and self-loathing, deception, useless fears . . . . They always come when food is being used as a drug. It has not been always easy these past six weeks and I have not lost any additional weight but I am still keeping the pounds off. In happy/good times or in sad/bad - it does not matter; is a food fix ever worth bringing crap and cronies back into your life? Wow - what an amazingly powerful and beautifully articulated post! You are one very strong lady. 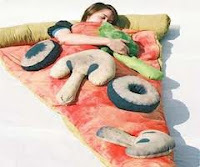 And on a more lighthearted note, that photo of the woman in the pizza bed is just plain disturbing. I hope it doesn't give me nightmares. You're so right, Jane, and so logical and honest in the way you've dealt with the recent stressors in your life; always remembering that food will NOT solve the problem but only create an additional one. I've been honestly saddened recently by a few bloggers who describe having had a bad day and still turning to a take-out menu or a bag of chips and a can of cheap fake sour cream dip to make themselves feel better, and insisting they are still helpless to resist the siren call of junk food when they've experienced some minor disappointment or frustration. Helen once wrote that when something happens she says to herself - I will not eat over it. And the she vizualizes/thinks of the worst thing that can happen and then says to herself - and I will not eat over that either. People do not understand there is always going to be something. And we simply have to learn how to cope with the something's. And you are right, might not loose weight during the something, but we have to learn how to hold our own. It does not help to wake up weeks or months or even years after somethings 20, 50, +++ pounds heavier. And our body needs nutrition during a something. One of the saddest things I see is someone leaving a comment that says "don't worry" or "you can't" about the weight loss thing while you are going through this difficult time. It is very enabling. And learning to deal is a part most of us are teaching ourselves now. As women, not only is there going to be a something, the something is probably going to bring a friend. And we have to learn not to invite a whole crowd in the choices we make. Awesome post. Very important skill to be able to both identify the root cause and take action to keep ourselves on track. No matter what. Thank you for posting about your experinces , Jane . It helps me to know that I'm not alone and I will come through the other side. Take care and safe travels. Hard to face the pain , but better than the pain and the pounds. Keeping your focus pays off in the long run. Karen P.
Excellent post. Can a post be more than excellent, if so this is. I quit smoking 10+ years ago, and during times of crisis have been tempted to start again. I say to myself, then you will have two problems, you have the crisis AND you will have to stop smoking again. There is no difference (for me) between overeating and smoking. Thank you for helping me make that connection. One thing I understand now more than ever before is that accepting help, even when I think I do not need it, even when I do not want it, is VITAL in this process. That concept is so important I am going to do a post on just that topic. It is too essential to this journey to leave it in the comments. I need to see it again and again. I am well today because I accept help. It is the one YES.